We like to use a loose-leaf calendar to keep track of the family schedule. Yahoo! Calendars is still invaluable for things like remembering birthdays and when the property tax is due, but for what events are going on this week, we find it more convenient to use a loose-leaf calendar that we can write on and leave near the dinner table. Very occasionally, I end up with a nice picture that might look good on a calendar, so I thought I'd make my own. The one shown above was made while testing (it's my sister-in-law becoming my sister-in-law... and oh, yeah, my brother's in there too). There are plenty of Photoshop calendar templates available, but I found all of them lacking in one way or another, so I wrote a Photoshop script to build a calendar. It's highly configurable, and so I thought that perhaps it might fit the bill for others' needs as well, so I've made it available for download at Jeffrey's Calendar Builder home page. What cheek! I thought I was the only Jeffrey living in Kyoto! Take it easy and thanks for the great calendar – will try to fill it with equally great pics. Great job! Thank you! I had just finished creating tables in Word, saving them as a PDF and had begun opening those files in PS and dragging that layer over to my image. Your script (the first I’ve ever tried) is SO much easier – and it’s great! Well done Jeffrey. I’d been looking for a way to generate calendars within PS to keep PS control over printing and profiles etc. Your script provides an easy answer. Do you use some kind of date generator for the Calendar or simply create the day/dates by hand. I’m using version 3b1 of your Calendar Builder and it doesn’t build February 2008. If you choose February from the dialogue box the script starts to build March 2008. The other eleven months seem to build ok. Your calender script is by far the best one out there. Creates the templates I have always wanted. Its very easy to create batch actions to change the appearance of calenders by changing the text layer styles and the opacity and fill of the groups and layers your created. 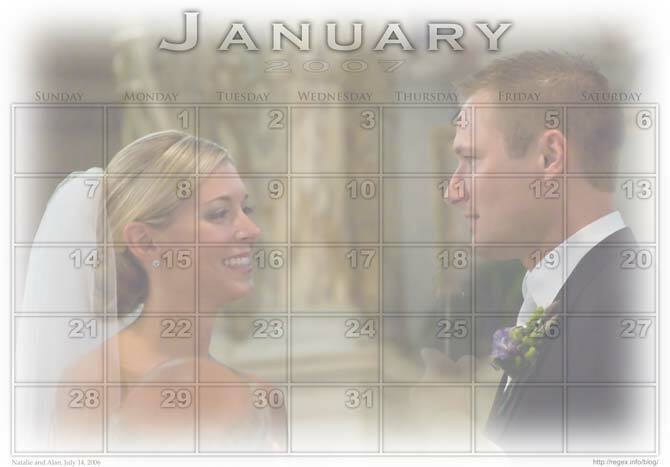 The only problem I had in creating these batch actions I created for the Landscape and Portrait Calendars was I had to duplicate the portrait one for the different size calendars because I transform the scale of the picture mask to force it to the image area with proper fades borders.